The Jungle, Playhouse Theatre. Photo: Tristram Kenton. The Wikipedia page for Calais Jungle today still largely reads as if it were still there: there’s a lot of present tense, especially in the “Opposition” section. The camp itself has been bulldozed, but refugees are still in Calais. And that opposition to them is still there too. The Jungle is difficult, and probably one of the better theatrical experiences I’ve had. Spanning from the initial building of the jungle to its demolition in a twisted-up order, it’s tightly directed by Stephen Daldry and Justin Martin, and written by Joes Murphy and Robertson. These two are the founders of Good Chance, a theatre which stood in the jungle and which has now moved to work with refugees in Paris. Not knowing this about the company, there might be some scepticism. Even knowing it, there still might be. Accordingly, I don’t think I’ve ever worried as much if a show was in good taste or not, and it’s got everything to do with the intensely detailed production. The Playhouse Theatre has been given the same treatment the Young Vic received last year – but the transformation here is more drastic. From seating in ‘blocks’ at benches and table-walkways (divided into ‘Afghanistan’, ‘Sudan’, with ‘Cliffs of Dover’ as the circle) with the cinnamon in Salar’s Afghani cooking around you, the actors resting their hands on your shoulders and climbing over you, to the dirt on the floor and the stalls with rows of soft drinks and Lycamobile SIM cards on sale which the audience walk through to get to their seats. This is a set unlike any I’ve been in before, designed by Miriam Buether – immersive doesn’t begin to cover it. It’s astounding. And it makes unignorable the strangeness of us being here, the strangeness of this production existing in the West End at all, and everything Maddy Costa wrote in her incomparable review which made me reluctant to take this on at all. You want to meet these characters. You want to reach out and touch them and know them and help them, yet it seems like such an insult to the stories being told to even want to try to get involved. The aid workers in the play are all white, but there’s endless diversity among the refugees. Ammar Haj Ahmad’s Safi, a literature student from Aleppo, acts as the narrator, and he seems less desperate, more amused than everyone around him, until he himself is offered the chance to make the crossing to Britain. He’s just the same as everyone else, in a situation just as suffocating. 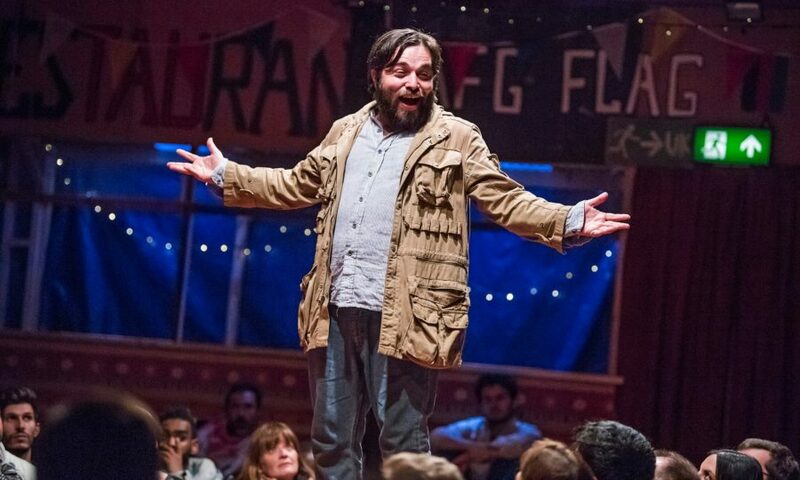 Ben Turner is leading man material as the powerful owner of the camp’s Afghan restaurant (which AA Gill actually reviewed in 2016), roaring and weeping, but this play is about more than just one character. It has to be representative, and largely manages, though women get much less of a look in than men (Nahel Tzegai is a strong exception). Other standout performances come from Mohammed Amiri as the fifteen year old Norullah, and from the incredible John Pfumojena as Sudanese seventeen year old Okot. Pfumojena is somehow responsible for the composition and musical direction of the The Jungle, as well as supplying one of its best, most painful performances. The story itself is simple. It’s the production’s pace, intimacy and honesty that electrifies. The storm brews inside the tent rather than outside; we’re included in it. We learn about the techniques of stowing away across the border in lorries from Norullah, in the form of an English lesson delivered by a teenage charity worker. It’s funny, and also not funny. The play is aware of that. But I still wonder if that’s enough. We’re in this strange mock-up of a space that no-one wants to inhabit (but everyone has paid money to be here), and what we’re seeing is informed by what Murphy and Robertson learnt and experienced in Calais, but it’s simultaneously something artificial, something crafted. And then there’s the moment where the body of Alan Kurdi – the three-year-old Syrian washed up on a beach – is shown on screens in front of us and on phones held by the actors. And that’s real. Though he only has a few minutes to speak, Rachid Sabitri’s Ali is a central figure, a man paid to take people across the border into the UK. He defies his categorisation as a “smuggler”, arguing that he is a Kurdish freedom fighter, even here. He is unconcerned with the deaths and injuries of the children and adults who put their faith and money in his hands. More and more people will take this chance, following the destruction of The Jungle two years ago, and the danger of human trafficking is only increasing. I want most people to see The Jungle. It feels important that they do. But how? Seats in the circle/’Cliffs of Dover’ are much cheaper than sitting in the area designated as ‘Afghanistan’, for example, but it makes for a completely different show. The copy on the website tries to sell this as a “choice” between different experiences, but this production will stay with me for the unrelenting closeness of the evening, the sweat of the actors, the ketchup much too near to me. Those in the circle are indeed at a distance, like the cliffs. I was overwhelmed sitting in the thick of it, but I can’t afford to give that same time to the people I’d like to see this, with the exception of Theresa May: I would find a way for to pay for her to watch this, preferably via the Ludovico technique. Possibly forever. The Jungle is at the Playhouse Theatre until November 3rd. For more details, click here.